If you’re born in December, you have some very good options to deal with the winter. December birthstones are beautiful and usually available in the shades of blue, bringing a whole new meaning to ‘winter blues’. Tanzanite, turquoise, and zircon are the December birthstones. They are affordable but look equally precious as other expensive gemstones. These birthstones include the most modern one (turquoise) that is used in jewellery, an ancient stone (zircon), and a recently discovered gemstone (tanzanite). Hence, people born in December have a choice of choosing between the three gemstones to make their chilly winters bright and delightful. Women born in this month can use these gemstones in their jewellery, while men can flaunt their style with their bike chain cufflinks made up of these gemstones. Zircon is the oldest gemstone. Gemstones found in Australia helped to age the earth’s crust. The most popular shade of this stone is sparkling blue, although it is available in rainbow colours. Zircon has been used in jewellery since the middle ages. According to some beliefs this stone has magical properties and can be used to solve problems, prevent nightmares, bring wealth, encourage honour and protect travellers. Tanzanite has only recently been added to the list of December birthstones, since 2002 to be exact. This gemstone was first discovered in Tanzania in the 1960s and is now very famous because of its beautiful shades. The stone was named by Tiffany & Co after the small area it comes from. All the world’s tanzanite come from an area of just 4 square kilometres in Tanzania. It reflects blue, violet and red. Hasso uses created tanzanite made from cubic zirconia in its birthstone cufflinks. 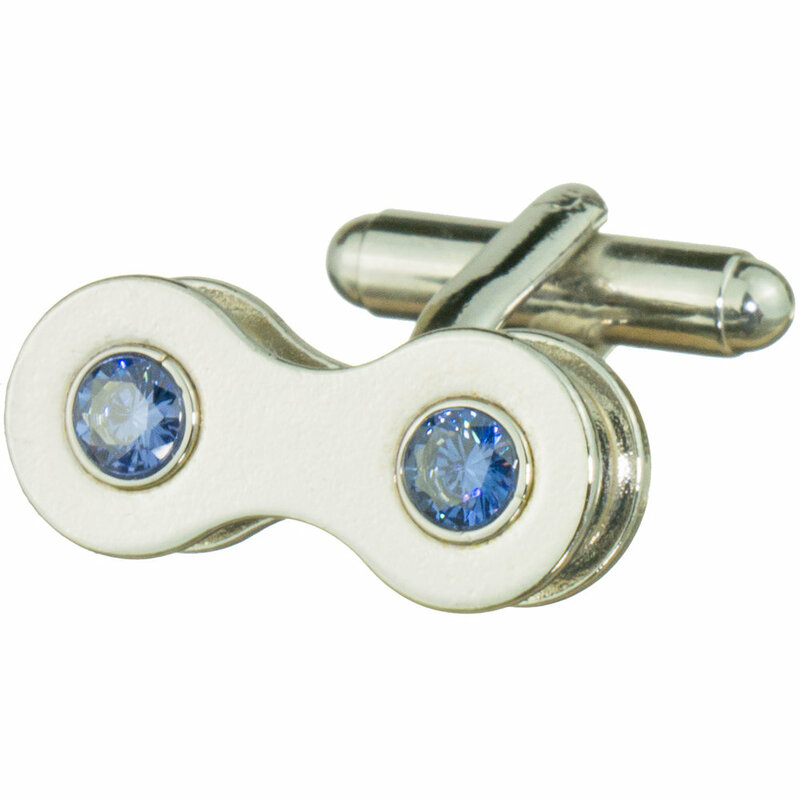 Our silver tanzanite cufflinks are one of our most popular styles. Turquoise has been used in jewellery for millennia. Perhaps most famously it is used in the burial mask of Tutankhamun. In more recent times it is used to give an oriental style or emphasise an art deco look. The primary colour of this stone is blue-green, with either black or dark brown veining. Turquoise is elegant and interesting due to the unique veining in each stone. Stones usually come as cabochons (rounded top) or beaded. It is a very porous and relatively soft stone, being only about as hard as glass. It needs careful treatment, as it absorbs polish and oils and can discolour easily.